The stout Dallas defense was gashed for 273 yards and Ezekiel Elliott didn't come close to keeping pace. Here are five reasons the Cowboys are done for the season. For the 23rd year in a row, the Cowboys didn't advance past the divisional round of the playoffs. Their season ended Saturday night in Los Angeles with a 30-22 loss to the Rams, who dominated the first half and held off a late comeback attempt to earn their first berth in the NFC Championship since 2001. Here are five reasons the Cowboys fell short in the City of Angels. In the Wild Card round, the Cowboys held the NFL’s top rushing attack to 73 total yards on the ground. They had no such luck in the divisional round. Todd Gurley gashed the Dallas defense for 7.2 yards per carry, tallying 115 yards on 16 carries. CJ Anderson – who filled in admirably in Gurley’s stead for the final two weeks of the regular season, led the Rams in rushing with 123 yards. Dallas’ defense, which had averaged 93.3 rushing yards allowed coming into the game, gave a whopping 273 Saturday. After the Rams resorted to the pass on third-and-short in Cowboys territory on their first two drives, they stuck with the run for back-to-back touchdown drives that gave them a 20-7 lead at the half. Los Angeles didn’t punt the ball until the 3:14 mark in the third quarter. Linebacker Leighton Vander Esch said the Cowboys beat themselves in the first half, in which they gave up 170 yards on the ground and mustered just one scoring drive. “It’s the playoffs. You can’t take the first half off,” he said. 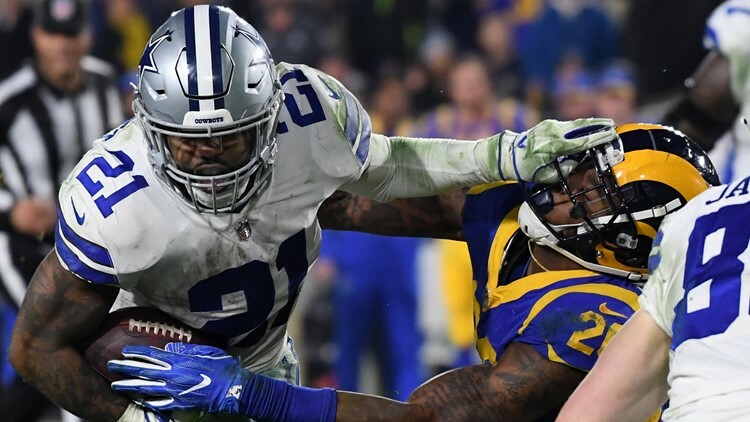 The fact that the Rams defense surrendered 5.1 yards per carry on the season was well-documented heading into their bout with the league’s leading rusher in Ezekiel Elliott. It was a different story Saturday, as Zeke totaled just 47 yards on 20 carries. The Dallas defense appeared gassed early in the game as the Rams totaled 36 plays on their first three drives. Rams quarterback Jared Goff had thrown just six touchdowns and six interceptions over the Rams’ last five games of the regular season, making the LA offense look like a shell of its elite self from earlier in the season. Saturday night, he protected the football, making a mere 15-of-28, 186-yard performance enough to win. Dallas converted its first two fourth-down attempts – once on the first drive of the game and once in the third quarter – to keep two touchdown drives alive. Ezekiel Elliott rushed for five yards both times, up the middle the first time and on a well-designed play off tackle the second. In the fourth quarter with the Cowboys down eight, though, Elliott was stood up for no gain on fourth-and-one and Dallas turned it over on downs. Los Angeles would march down the field for a touchdown to make it a 15-point game. Dak Prescott’s ability to improvise with his legs is one of his best assets – one that proved critical in several of Dallas’ wins this season, including its Wild Card win over Seattle last week. The third-year quarterback rushed just two times for three yards, including a one-yard touchdown, Saturday. Meanwhile, it was Goff who took off from the pocket for the game’s most crucial first down. On 3rd-and-7 with just over two minutes to play, Goff scrambled for 11 yards and stayed in bounds to all but ice the game. An overwhelming home-field advantage for the Rams was certainly not a contributing factor to the Cowboys’ downfall Saturday night. The thundering applause was virtually the same on any given play, no matter the outcome, among a Los Angeles Memorial Coliseum crowd that was nearly split. WFAA caught up with a raucous group of tailgaters – hundreds strong – with the Southern California Dallas Cowboys Fan Club.